A Day At The Fair - framed by Sherree Valentine Daines // £826.80. You may have noticed that this is a rare and unique 'on canvas board' piece, which Sherree has added to her limited edition collection. 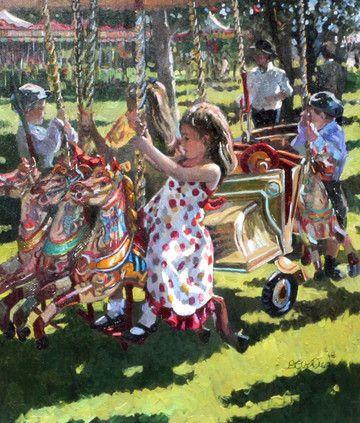 The vibrant burst of oils which encompass the canvas, capture the joyous mood of the children riding on the merry-go round. As you'll agree, this is a charming and appealing piece of artwork which is sure to brighten up any room it is placed in! What sets Sherree Valentine Daines apart from her artistic contemporaries, is the ability to remain a 'Traditionalist.' If you're familiar with Sherree's work then it is apparent how she takes great influence from the masters such as Renoir and Monet. She stays true to her Impressionist style whilst still encapsulating a contemporary twist, capturing figures in the midst of their actions and paying great attention to their manners and gestures.